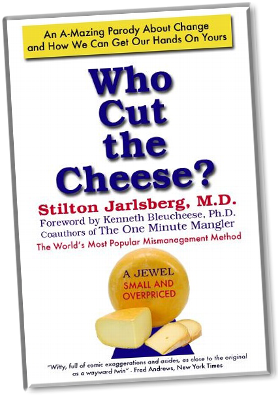 Buy Now - Who Cut The Cheese? "Who Cut the Cheese?" set an all-time record for flying off the shelves. Noted literary agent "J.D." said "In all my years of publishing, I've never seen anything like it!" And now, the beloved parody "Who Cut the Cheese?" is back in print with updated content for 2011! What better way to try to cope with the worst job market in living memory? Click on the links below to order a copy for yourself, or as the perfect gift for anyone who is either out of work or afraid of losing their job. And seriously, isn't that ALL of us now?! Please note that, like the original "Who Moved My Cheese?," this is a skinny little book of 70 pages...so please don't be expecting "War and Peace," okay? It's SEVENTY pages! However, it costs much less than the original bestseller - and frankly, the only laughs associated with that book came when employers gave people a copy as part of a "separation package" when they fired you.